The U.S. Department of Labor has a comprehensive open government plan to make government agencies more transparent, accountable, and responsive. We produce mountains of data on enforcement actions, employment, wages, and much more. This data can be useful for those struggling to find a job, workers looking for ways improve their skills, and consumers who want to know that the businesses they use provide safe, healthy, and fair workplaces. As part of our Open Government Plan, the Department is working to “liberate” this data; because we know this information is valuable, but we also know we haven’t thought of every way to put it into the hands of the American people — at home, at the office, or on the go. We also want to get your thoughts on how we can improve our transparency and information sharing, engage the public in the Department’s efforts to leverage data, and encourage conversations between our staff and all of our stakeholders. The OSHA Heat Fatalities Map map shows locations of outdoor worker, heat-related fatalities between 2008 and 2012. It is not an exhaustive list of all worker fatalities from heat exposure during this time period. It includes only those fatalities that involve workers who are covered by either the Federal Occupational Safety and Health Administration (Federal OSHA) or a State OSHA plan. Some fatalities reported to the Bureau of Labor Statistics (BLS) are outside Federal and State plan OSHA jurisdiction and are not included. 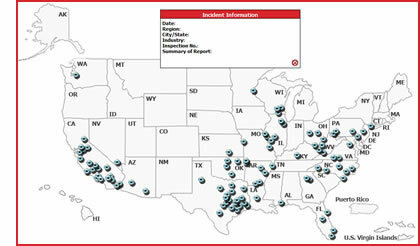 In addition, reporting and update timeframes for the Federal OSHA information systems used to generate this map vary from BLS and are based on the circumstances of the case, which may result in inconsistencies.